Could The Joker Really Appear On Gotham This Season!? 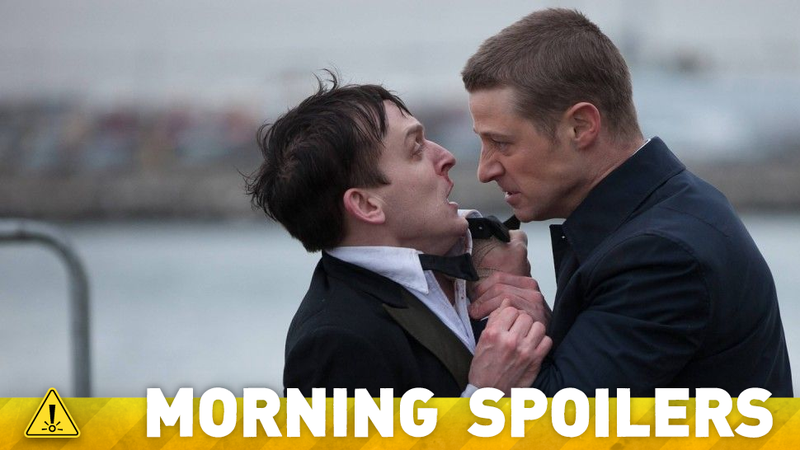 Filed to: Morning Spoilers.Filed to: Morning Spoilers. Check out new Avengers: Age of Ultron pics. Another geek icon joins AKA Jessica Jones. Freddie Prinze Jr. talks about Star Wars: Rebels' second season. Plus glimpses of Inside Out, Seventh Son, Minions and Person of Interest, and what's next for Sleepy Hollow, Once Upon a Time and Defiance. Behold, Spoilers! Scarlet Overkill has fantastic hair, wears great clothes and has a lethal uppercut," says producer Chris Meledandri, head of the animation studio Illumination Entertainment. "When we turn her loose on the world, she is going to come out standing on top."" "Even in the '60s, when males dominate the social world, Scarlet is the clear choice to follow for pure villainy. Her husband and fellow villain, Herb Overkill (Jon Hamm), is so devoted to her that he took her name in marriage. "Scarlet is an unusual supervillain. She is a dangerously charming woman, which could not have been easy in the late 1960s," says Pierre Coffin, who directed the film with Kyle Balda. Fanning will play the teen surviving as one of the last people on an abandoned post-cataclysmic Earth, who is racing to find a cure for her poisoned home world before the last shuttle off the planet to the distant human space colony leaves her stranded. Luna will play a complicated and mysterious refugee on his way to the shuttle launch who makes her question whether she can really alter Earth's fate. "We've said you're going to be waiting a bit longer for it, but this is America — nobody wants to wait," Heller tells TVGuide.com with a laugh. "So, we will scratch the surface of that story, yes. But just scratch it — a little tap on the door." "Penguin [Robin Lord Taylor] was born a sociopath and was always going down this path one way or another," Heller says. "Nygma is someone who becomes the villain, and we see that journey begin in the second half of the season." Jada Pinkett Smith: Well, it's not quite over yet, but we'll see if Fish survives the season. It's a little tense from here on out. That's for sure. It's a little rough on Fish from here on out. I think you're going to see a lot more color from Fish in the next episodes to come. I think you're going to see a lot more vulnerability. I think you're going to see a lot more of a human side of Fish Mooney. I see Fish Mooney as kind of an extreme version of a woman. A woman who wears many faces. A woman who is strong, but yet afraid. I would say that the Fish Mooney character has, especially in these coming episodes, been really fun and I love how smart and perceptive that she is. She just decided to use her skills — you know, she's a criminal. She decided to be a criminal instead of a doctor. But I really love her, and I love what's she becoming too. I think in the next few episodes, and definitely towards the end, you're going to see a whole different Fish, and a woman that definitely has some heart. You've seen the ruthless, now you're going to see some heart. I think she saw Penguin as one of her adopted orphans, somebody that she kind of took off the street and helped them become something. I think that she felt deeply betrayed by Penguin. It will be interesting to see where their relationship goes from here. Right now, they're not getting along too well. They're pretty upset with him. But it will be interesting to see where it goes from here, with the two of them. We haven't seen much of Henry Parrish (John Noble), Abraham (Neil Jackson) or Orion (Max Brown) in recent episodes. What have they been up to? We shall see. We have plans and ideas that have been percolating for all the characters. We hope at the right time to be able to bring them in and catch everyone up on what they've been up to. The main thing now is focusing on Abbie and Crane and getting to stay with them and their point-of-view on the world. An undead Captain Irving (Orlando Jones) has resurfaced and Henry obviously still owns his soul. How concerned should they be over that little fact? I would be very concerned. As much as they are relieved and want to embrace Captain Irving returning, they know he is not in control of his soul. They have struggled with this with [John Cho's character Andy] Brooks in the past, so they have some experience with the undead. As much as Irving seems to present as normal, they are going to be very wary as the episodes progress. Abbie, Crane and Jenny are very resourceful and will be looking for ways to circumvent evil. What's on the horizon in terms of historical figures and ghouls that will be appearing? We are going to introduce Thomas Jefferson, who we've certainly referred to before as the architect of the masonic cell where we've kept Headless. The really fun thing is it's not just Ichabod Crane that gets to meet him. We're going to see Benjamin Franklin again. We'll see him in the finale in a context nobody would be able to guess. We have Reavers that will appear and are an intriguing monster that protect something the Witnesses would find incredibly useful. We also have a warlock, which is the first time we've featured one on the show. The season one finale featured cliffhangers at every turn. How ambitious is this year's finale? Creatively and production-wise, we are doing something in the finale we've never done before on the show. We've done a lot of crazy things, so it remains to be seen whether people find it as ambitious as before, but we're definitely going for broke. The visuals will lend an astonishing new perspective to your imagining of the story – hopefully in a good way. Also, the writers are fleshing out and adding new material to the book, so that we have some new characters and some new plot lines for the series. This will be a change – again – from the book, but I think we all have to remember that a change of medium requires an understanding that each new effort is an adaptation of the old, not a paint by the numbers. I am way cool with the changes, and I find it interesting to imagine how I would have incorporated them in the book, had I thought to do so. But I think once you've done something, you should leave it alone. This is a different imagining, but one that I have kept watch over while it is being developed and which I very much approve. Lea: What do you do to get into Kanan's character for a "Rebels" recording session? Is it a method acting mentality when you all get together? Freddie: To me the Jedi are samurai. Disciplined, loyal, alone but not lonely. With Kanan, that was his life, was. At a young age his master is taken, I can't say how, season 2 greatness. So now you have a kid, trained as a Jedi, who doesn't question his worthiness in battle but certainly is more street than book-smart, forced into a roll of leadership. So he's cocky, but complicated. He's patient but aggressive. Tough line to walk as far as staying true to the Jedi rules we all know and respect. The writers and Dave (Filoni) do a great job of making him pay when he goes astray so my job is simple; once I have THAT guy in my head and Dave breaks down the world around us its just about committing to the moment, regardless of how heavy or light the moment is. Lea: What can you tell us fans about what the future holds for Kanan? Freddie: What can I tell you about his future … Without getting force choked by Filoni from afar … At the end of season one Kanan will know what it means to be a Jedi. The selflessness necessary to be considered a master. Season 2 he learns how to let go. You'll learn his pain, in detail, in a scene Dave and I recorded in private. Kanan breaks down and gives you everything you've been wondering (unless you get the comics but you don't get to hear me lose my $@&! Without watching). The show is adding several cast members, too - Lee Tergesen (Oz) will play Castithan General Rahm Tak, "a ruthless, arrogant leader in the Votanis Collective who sees Defiance — now free of Earth Republic oversight — a symbolic target in his pursuit of power. Rahm is a well-read, brilliant strategist who imposes his army upon the town with force." Finally, TV Line has an exclusive clip from tonight's episode.